Friday, November 3 at 7:30 p.m.
Sunday, November 5 at 4:30 p.m.
As part of the Fall 2017-Winter 2018 Performing Arts Season’s “NOH-NOW Series,” Japan Society presents the world premiere of Rikyu-Enoura: A New Noh Play by Hiroshi Sugimoto. 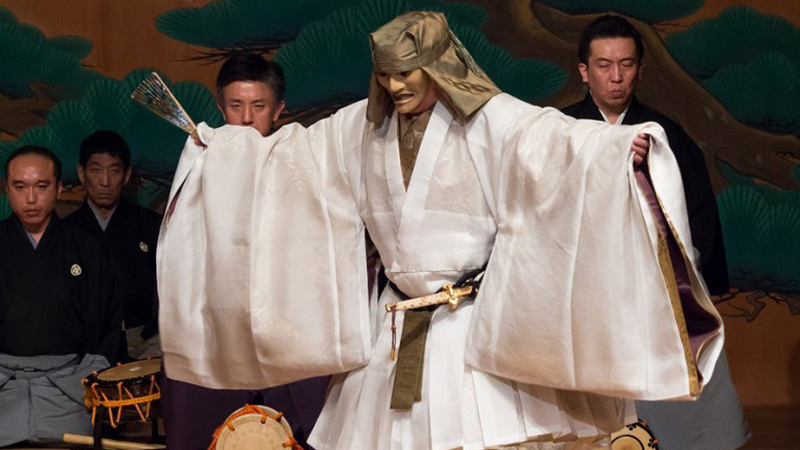 Commissioned by Japan Society and Odawara Art Foundation for the Society’s 110th Anniversary, this Noh play, which is newly written but adheres to Noh’s medieval language, is performed in traditional style with Noh masks, costumes, musical instruments, and chanters. Internationally acclaimed visual artist and traditional Japanese art connoisseur Hiroshi Sugimoto conceived and co-directs this new noh play, assembling Japan’s top Noh actors including Kanze Tetsunojo and Katayama Kurouemon and Noh musician Kamei Hirotada on o-tsuzumi (large hand drum), among others, along with Akiko Baba, esteemed Japanese traditional-style poet, as librettist for the medieval-language script. As part of the performance, a tea ceremony by Sen So’oku, direct descendent of revered 16th century tea master Sen-no-Rikyu, evokes Japanese life of long ago. Rikyu-Enoura is based on actual events centered around the forced ritual suicide of Sen-no-Rikyu (1522-1591), the tea master heralded as the father of chanoyu (Japanese “Way of Tea”), who influenced wabi-cha style’s emphasis on simplicity. Beginning in 1582, Rikyu was tea master for Toyotomi Hideyoshi (1537-1598), a samurai warrior who became the ruler of Japan by suppressing the turbulence at the end of Japan’s Warring State Period. Rikyu rose to prominence before his eventual suicide, ordered by Hideyoshi. 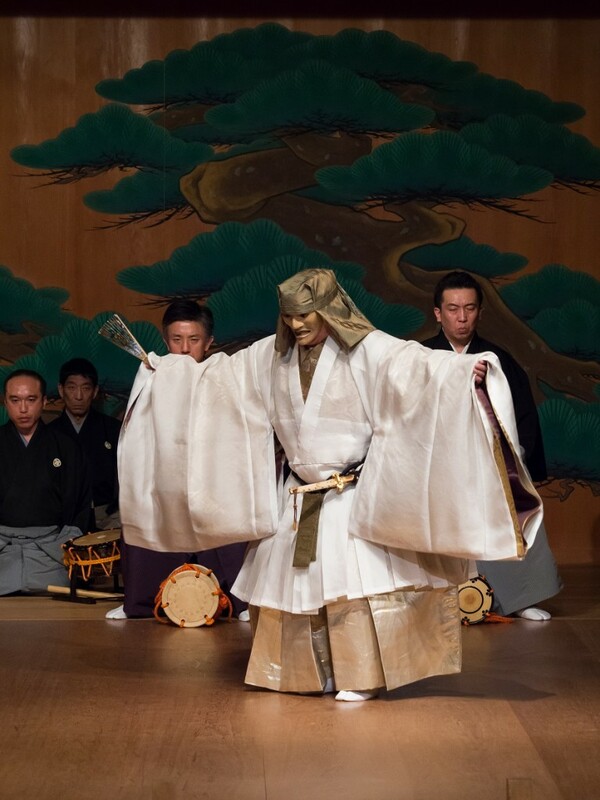 This noh play, as imagined by Hiroshi Sugimoto, is set several decades after Rikyu’s death. The story follows Hosokawa Tadaoki (1563-1646), the retired head of an influential samurai clan and disciple of Rikyu, as he journeys to Enoura (a present day town within Odawara City in Kanagawa Prefecture) to pay his respects to his master at the Tensho-an, the tea house that Rikyu built for Hideyoshi. Along the way, Tadaoki encounters an old man who describes details of a tea ceremony took place at the Tensho-an. In the second half of the play, the ghost of Rikyu appears, recalling how his minimalist aesthetics did not align with Hideyoshi’s extravagant taste, ultimately costing him his life. The play was inspired by Sugimoto’s time in Enoura in Odawara City, where he purchased a parcel of land on a hill facing the Sagami Bay to establish his Odawara Art Foundation’s main facility, Enoura Observatory, which opened in September 2017. When he learned that the remains of the Tensho-An were only 500 yards from this property, Sugimoto visited the site, beginning a deeper exploration tied to Rikyu and his time, the Tensho Period (1573 -1592). Drawing upon the influences of art and time and place, Sugimoto envisioned a concept for this Noh play. Rikyu-Enoura previewed in special showing at the MOA Museum of Art in Japan in February 2017, directed by esteemed Noh actor Asami Masakuni. This world premiere is presented in conjunction with Japan Society’s Fall Gallery exhibition Hiroshi Sugimoto: Gates of Paradise, which focuses on the 16th century and one of the earliest, and largely unknown, encounters between Japan and the West as seen through the eyes of Sugimoto. Japan Society reunites with Sugimoto following the 2013 presentation of the ritual Noh SANBASO, divine dance, co-presented with the Solomon R. Guggenheim Museum, with set and costumes by Sugimoto and performed by star Kyogen actor Mansai Nomura, and the 2005 modern Noh play The Hawk Princess (Takahime) with stage design by Sugimoto. The Tokyo-born Sugimoto has defined what it means to be a multidisciplinary contemporary artist, blurring the lines between photography, painting, installation, theater, and most recently, architecture. His iconic photographs have bridged Eastern and Western ideologies, tracing the origins of time and societal progress along the way. Preserving and picturing memory and time is a central theme of Sugimoto’s photography, including the ongoing series Dioramas (1976– ), Theaters (1978– ), and Seascapes (1980– ). In 1999, Deutsche Guggenheim commissioned and presented an exhibition of his series Portraits (1999– ). Sugimoto has organized and curated several exhibitions of his own work as well as traditional Japanese art, sometimes juxtaposing the two bodies of material in single exhibitions, such as History of History, which was co-organized with Japan Society (on view from September 23, 2005 through February 19, 2006) and the Freer Gallery of Art and Arthur Sackler Gallery, Smithsonian Institution. The will be a pre-performance lecture one hour prior to the start of each of the three performances of Rikyu-Enoura. Dr. Takeshi Watanabe, Assistant Professor of East Asian Studies at Wesleyan University, will discuss the history of the tea ceremony and Sen-no-Rikyu. The lecture is FREE and open to all ticketholders. For more information and to purchase tickets to Rikyu-Enoura, please call Japan Society’s Box Office at 212-715-1258 or visit their website. Conceived by internationally acclaimed artist and Rikyu-Enoura co-director Hiroshi Sugimoto, this exhibition visualizes an early encounter between East and West during a fluid, turbulent period in 16th-century Japan. Hiroshi Sugimoto: Gates of Paradise traces the journey of four Japanese youths who in 1582 were dispatched as envoys to the princely and papal courts of Europe, making them among the first Japanese to travel to the Western world and placing them at the mercy of global, political, and religious forces far beyond their control. The exhibition includes tea implements attributed to tea master Sen-no-Rikyu, the protagonist of the Noh play Rikyu-Enoura, as well as East-West hybrid nanban paintings, among the type of artwork supported by Rikyu’s patrons and Japan’s powerful 16th-century rulers, Oda Nobunaga and Toyotomi Hideyoshi.